•Using electricity as its energy source, heat pumps are used for either the heating or cooling of your home by transferring heat between two reservoirs. •In the warmer months, the heat pump acts like an air conditioner, removing heat from the air inside your home and transferring it outside. 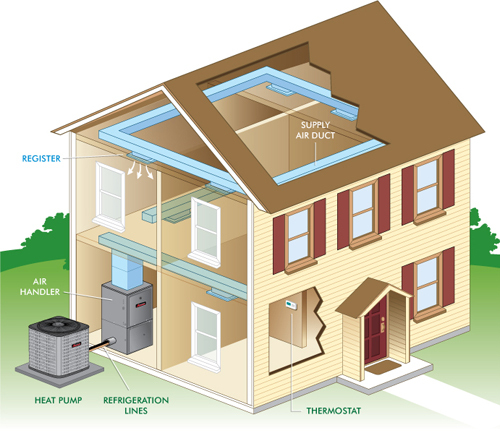 •During colder months, heat from outdoor air is extracted and transferred to the interior of your home. Believe it or not, even a 32° Fahrenheit day produces enough heat to warm a home using a heat pump. •Year-round, energy-efficient indoor comfort for moderate climates. A central heat pump helps maintain comfortable temperatures inside your home and reduces humidity levels year-round. Homes located in regions with severely cold temperatures may either require supplemental heating or be better served with an air conditioner/furnace combination. •Cleaner air. As your heat pump system draws air out of various rooms in the house through return air ducts, the air is pulled through an air filter, which removes airborne particles such as dust and lint. Sophisticated filters may remove microscopic pollutants, as well. The filtered air is then routed to air supply ductwork that carries it back to rooms. Whenever the air conditioner is running, this cycle repeats continually, constantly filtering and cleaning the air in your home. •Quieter operation. Because the compressor-bearing unit of the typical central heat pump system is located outside the home, the indoor noise level from its operation is much lower than that of a free-standing air conditioning unit.